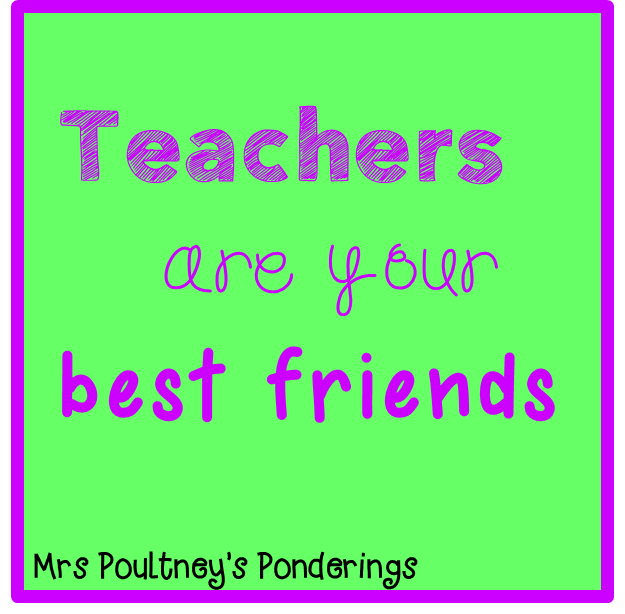 Why teachers make great friends! If you are reading this post then you are most likely a teacher. Send this post to your friends :) Here are 10 reasons why your teacher friends are great! 1. You are always on hand to help spell tricky words. You could almost be called a walking dictionary. "Do you think that is a wise choice?" 3. Doctors writing is not indecipherable to you after reading some of the "writing" from your Kinder kiddos. 4. You can carry on a conversation with multiple distractions around you.....and still keep an eye on that kid in the cafe who is rocking on his chair. 5. You are always available for coffee....on school holidays. 6. If anyone needs storage solutions you have a cupboard/room/shelving full of various sized plastic containers, with and without lids! 7. You are cool under pressure and have been known to defuse a potentially dangerous confrontation with, "Use your words, not your anger." 8. There will always be a pen/pencil/crayon/marker/highlighter/piece of chalk or all of them in your handbag when someone needs a writing implement......and you will correct their grammar as they write. 9. Praise is second nature to a teacher, and you have been known to praise your friends for their life choices, fashion choices or behaviour......sometimes you give a gold star just to reinforce that praise. PS, thanks to Jennifer Jones for the awesomely cute fonts! So I got this Reading Response packet up and running, which I will be using on my subbing days as well as my regular Year 2 classroom. More than likely I will add to this as I think of more response sheets, so if you grab it now you will get more in it later :) This packet will be on sale for half price for the next 24 hours. 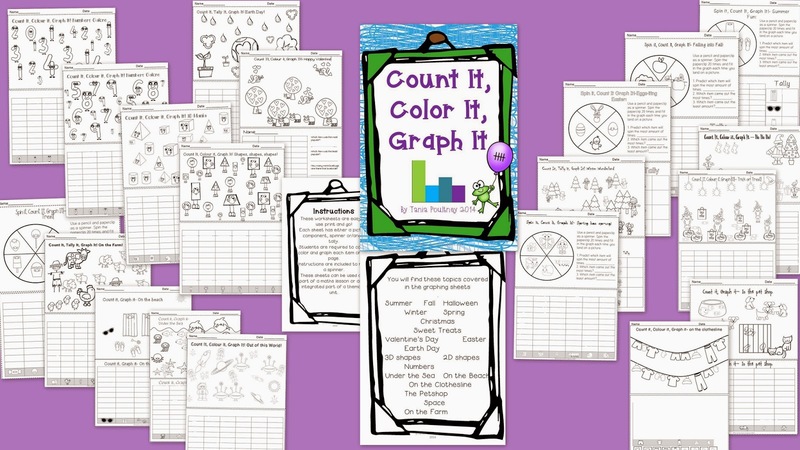 Count it, Color it, Graph It! I am heading into my last week of holidays and I have really enjoyed lazing around, having fun with the kids and catching up with family. I have to say that I haven't been as focussed on my blog as I could have been so I am linking up with Brooke from Teachable Moments for a Patch up Post linky. I am ready to show my blog some lovin' again! Another thing I have been also neglecting is finishing some files, I finally finished this packet, it has been one of those files that has sat in my "to finish" file for aaagggeess! So I dug in and got it done! Here is the final product! Count It, Color It, Graph It!! There are 20 print and use sheets! Kiddos need to count how many of each item there is, coloring as they go, then they graph the amount. I have also put in a few Spin and Graph, as well as Count, Tally and Graph. I have included the Seasons, celebration days (Easter, Christmas, Halloween, Valentines Day) as well as some number and shape sheets. I also threw in a few thematic graphs, so if you are exploring the sea, just whip out your Under the Sea graph and Bob's your Uncle ( or whoever your Uncle is! ), Down on the Farm, you got it covered! I can't wait to head back to school so I can get these onto Maths rotations! Not only that but I know for sure that I will be using these on my subbing days, I love having something that I can print and use that is not busy work, has a hands on aspect and gets the kiddos thinking. I will be adding to this packet as I think of more graphs to add so if you buy it now you will get the extra upgraded file for FREE! Just click on any of the pics above to get your copy! Earlier this week I posted about how we have helped my son become a better reader, you can read about that here. Today I thought I would talk about how to encourage those writers that seem to need a cattle prod to put pencil to paper. Make sure you read all the way to the end to get your tips and tricks sheet! I have found that reluctant readers and reluctant writers usually go hand in hand, this makes it somewhat easier to have a target group. So to help you out I thought I would write down 5 things you could do in your classroom today to help out those kiddos that make you want to tear your hair out when you hear those deathly words "I don't know what to write". The very first thing I make sure I allow reluctant writers to do is to TALK about their writing PRIOR to writing. I have found particularly with boys that talking about what they want to write seems to help them put their thoughts in order, you could take this a step further and encourage them to draw while they are talking. The way I would set this up in my room is to ask students to pair up or have them in small groups, then set a timer (usually around a minute and a half to 2 minutes) and tell them to take turns telling each other what they are going to write about. I would do this after the introductory lesson. You may need to practice this a couple of times and take a little wander around to make sure your target kiddos are on task, but once they have gotten used to it I have found it really helps. We all know that kiddos learn in different ways, some are aural learners, some are kinaesthetic, some are visual. As I mentioned above this technique can be used in tandem with talking. Essentially you let the kiddos draw the story BEFORE they write it, this can be done in a variety of ways. Kiddos can make a story map, a simple line drawing, a comic strip, anything! Again, you may need to put a time limit on this as it can become very involved for some kiddos :) Remind them that the focus of the lesson is the writing and the drawing is just to remind them of their ideas. This can work for all types of writing including drawing the steps of an opinion piece, information report or procedure. I also encourage students to write a few words around their pictures to give them that extra reminder and that extra practice! Sometimes our kiddos have AMAZING ideas but just get overwhelmed at the thought of writing so much. It is ok for kiddos to work together to produce one piece of writing and it is also good practice for co-operating. Pair the kiddos up keeping in mind their abilities, you can choose to either assign one of them as the scribe or let them choose. You could even ensure they share the writing if you really need to. Again if it is a physical thing that is the blocker for some of your kiddos, get them to record their story using an ipad or similar device then transcribe the story for them. Providing some writing prompts can sometimes give those kiddos a little nudge in the right direction. I have a file of interesting pictures that I have cut out of magazines and newspapers (yes, that is old school) I make this available for kiddos to have a look through and then glue the picture into their writing journal or book. I love to use this for Free Choice Writing activities so that there is less pressure on kiddos for producing a written piece that has expectations attached to it. You could also have a whole class writing prompt by displaying it on an IWB if you have one or a series of large poster pictures displayed around the room. It is important to make writing an everyday activity, so that it becomes something that is a normal and routine part of a child's day. I know that sounds like it is easy but it can be trickier than you think, especially with all the technology in our schools and homes. It is important to set a small amount of time (10-15 minutes) of each day and make sure the kiddos know this is writing time, quiet, individual writing time. By all means use the previous tips to get them writing but I cannot stress enough how important it is to get kiddos to see that writing is something we do everyday. Finally I want to leave you with a little trick I use for those Kinder/Prep kiddos on their very first day of writing. I have a small basket that is filled with glitter, I do a quick modelling lesson on the board of writing a sentence, some of the words are correct, some misspelled and some just a squiggle. Then I ask the students if they can read it, generally they shake their heads no, then I try to read some of it unsuccessfully. At this point I pull out my basket and I tell them that it is Magic Writing Fairy Dust (as the sign on the basket would say) and if I sprinkle it on my head I will be able to read my writing because it will say anything I want it to say, that was the magic part! (Yes I am a drama queen!) I demonstrate the sprinkling and then magically I am able to read my writing!!!! AH.MAZING! Then I tell the kiddos that if I sprinkle them with the fairy dust they will also be able to read their own writing no matter what it looks like or if nobody else can read it. I am telling you they eat this up! Then I send them off to draw and write and without fail every single one of those littles will write something. 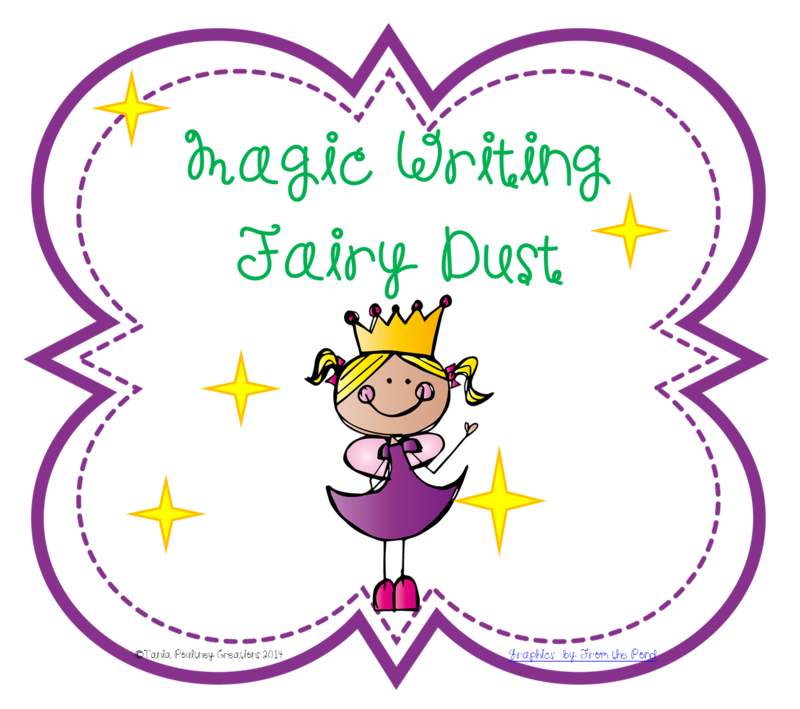 So as a reward for you today for reading ALLLLL the way through this long post I am giving you 2 Freebies, the first is a sign for your Magic Writing Fairy Dust and the second is a tips and tricks for reluctant writers sheet to print and keep! Yay! Just right click on the pic and save as a picture. You can download this FREE Tips and Tricks Sheet by clicking on the pic! I hope you have found something useful in this post. This post was inspired by my son who is one of those "reluctant readers". Even though we often read to him as a toddler and into his early years of school, he never really veered from listening to stories to reading his own books. This year he heads into Grade 4 and while I would not label him an "avid" reader I would certainly take him out of the "reluctant reader" box. How did we do it? Hmmmm, I have thought a lot about this wondering if there were some little ways I could apply it in my own classroom, this is what I have come up with. 1. DO NOT put undue pressure on the child to pick up a book, it needs to come naturally or it will be seen as a chore and not something of pleasure. This does not mean that we never steered him towards books but we used subtle manipulative ways instead of flat out saying, "you need to read!" This became particularly difficult when it was time to read the dreaded Home Reader, I have seriously re-thought Home Reading as a teacher since having my son in school. 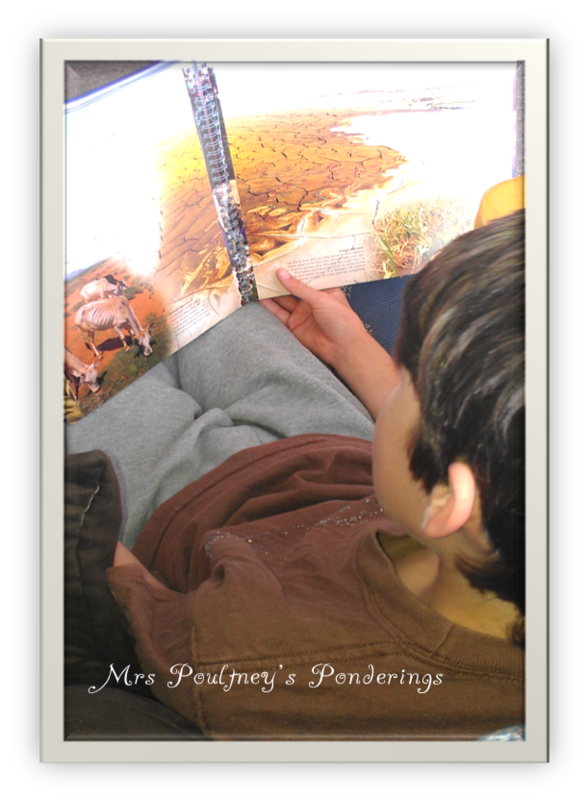 We did not let him get away with not reading for school (well not often....) but we did share reading. I would read a sentence/page, he would read a sentence/page, or I would read the book first, then he would read it. There were many days that would end in him sprawled across the floor, saying " I don't want to do this!!!" We tried to minimise these days and when it came to that we would reduce reading time and break it up into chunks, "We'll read a bit now and then some at bedtime" Eventually we would extend the time and those outbursts became less. Find out what your child is interested in, what makes his face light up when he talks about a particular topic/genre. For us it was anything that was Non Fiction and later anything that involved humour, so we searched out books that would support this interest. He particularly liked Non Fiction books that also had big bright illustrations or diagrams that had short labels, this gave him a short burst of interesting information with the support of a picture to make even more inferences. I class my self as an avid reader, I am happiest when I have a juicy thick book in my hands, curled up on my reading couch, usually with snacks and a drink. My son has seen this throughout his whole life and when he asked me why I read so much I knew this was a prime opportunity! My answer to him was that I liked to read to create a movie in my head, this way the movie belonged only to me and I could make it look and feel anyway I wanted. I told him that when I read something particularly interesting or exciting I could close my eyes for a few moments and run the movie in my head. We tried it out and that was when the light went on for him. Every child has creativity and imagination and as a parent you know the best way to tap into that. 5. Be Patient and offer variety. This is really hard and I have been guilty of losing it when my son would flatly refuse to read. What helped me is to remember that introducing new skills/interests/hobbies to a child is the same as introducing new foods (yes my son is one of the fussiest eaters I know). You have to offer the same food multiple times to a child before they will even deign to try it, the same can be said for reading (and writing for that matter, but that is a whoooole other post!) offer a variety of reading for them to "taste". Comics, non-fiction, fantasy, short chapter books, magazines, internet sites, are you getting the picture? While this is not an exhaustive or complete list, these are the things that seem to have worked for us. My son is now 9 years old and is now more regularly asking if he can read before bed, this is exactly what we were aiming for, a child that wants to read for pleasure. Is the job done? Not by a long shot, but we will continue to foster a love for reading and hope that he will make it an everyday pleasure. I hope you have found at least 1 little thing in this post you can use in your classroom or with your own child. 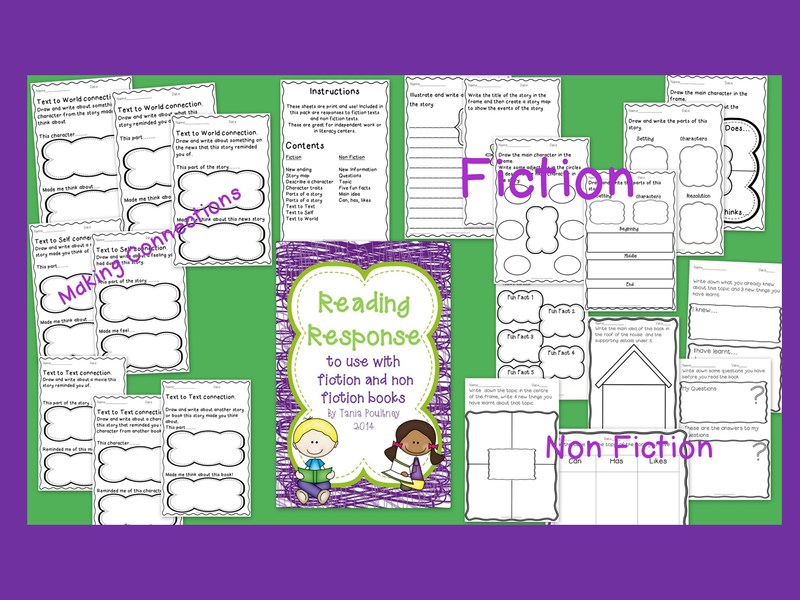 I have created a send home sheet for you to give to parents in your classroom that may help them with their child. Just click on the pic to download. PS just found a typo in my note!!!! OH NO!! Never fear, I have updated the sheet with the correction and a new link! I just wanted to pop in quickly this morning before I head out for a run (yes I am still going, yay for me!) to let you know about a FREE product I mad just the other day in honour of welcoming the New Year. This is an easy to use print and go sheet for the classroom. These pages allow for students to write 3 goals for school and 3 goals for home, I intentionally made the spaces so that they can be used for writing or drawing. I will definitely be using these when I go back to school at the end of this month. This one allows for students to put their own name on it and personalise it a little more. Want a copy? Well all you have to do is click on the pics above to download your FREE copy for your kiddos. 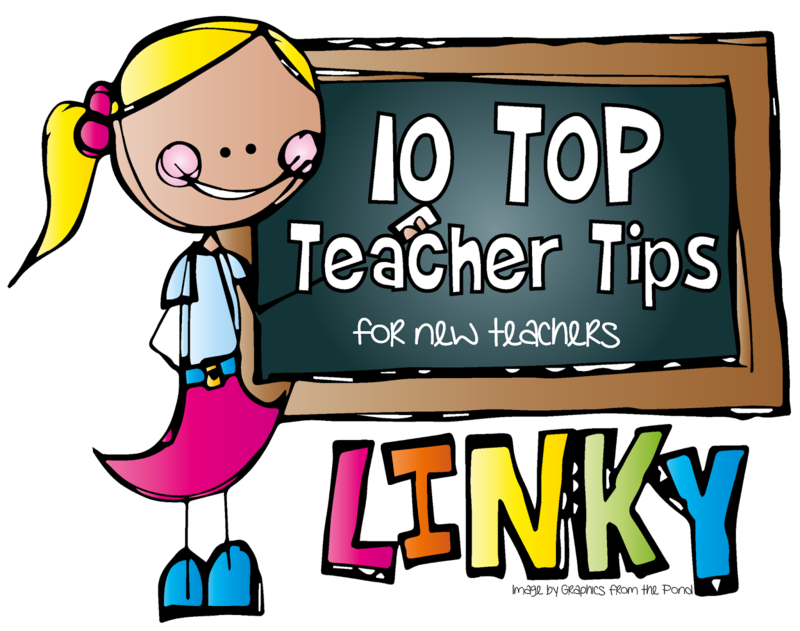 10 Top Tips for Teachers linky! I am linking up with Lauren from Love, Laughter and Learning in Prep for a 10 Top Teacher Tips linky. She started this linky to as a way to help beginning teachers (or not so beginning!) 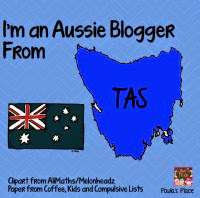 in the first few days/weeks/months of the school year, which in Australia starts in about 3-4 weeks....eeeek! So here are my top 10. Label EVERYTHING!!! and file as soon as you can. The last thing you want or need is to have piles of papers on your desk, not only does is look untidy, when somebody wants something or needs a paper or file that you have, you look really unprofessional having to sort through the towers of papers on your desk. How do I know this? I have done it :) Most embarrassing when the tower topples and you are then scrambling around on the floor. So how do I avoid this now? I have a desk top file that I have labelled and can easily pop papers into eg, student info, assessment, to copy, notes to go home, I even have a "to file" file, heehee. Over the years I think I have evolved from that teacher who has no idea about behaviour management to a teacher that generally has a calm classroom with consistent rewards and consequences. Yes I will admit at one time I was a "yeller" but seriously all that did was provide a release for myself and created a bad model of behaviour. Now my students just need a look or a gentle touch on the shoulder to remind them to be on task. Above all the one thing I have learnt is to follow through with any kind of system you have set up. If it is 2 warnings and an exit, you need to make sure you follow the procedures. Children are master manipulators and will quickly work out if you do not apply the consequences. I may have to blow my own trumpet here for a bit, this is something I am REALLY good at, primarily because I move on average every 3 years and I am a bit of an extrovert. It is really important to not be afraid to ask questions about anything you are unsure of, every school will have their own way of doing things and most schools are working towards whole school programs. You may be expected to take part in things you have never heard of, my top tip for this is don't be afraid of change, embrace any new opportunity. There are always people in schools who will step up to help you out. Hmmmm, I strive every year to be better at this. The one thing I know has helped me is to have a timetable up every day in the classrooom. This is great for students who need a visual timetable as well, so it serves 2 purposes :) I also try to go into the classroom earlier rather than stay later, so it doesn't cut into my family time, for me that has been really important. Humour and drama. Does this mean you have to be a comedian is the classroom? No, but adding a bit of a laugh as a brain break helps to get those kiddos who are almost incapable of sitting on the carpet for less than 10 seconds a chance to re engage with the group. I also like to throw in a bit of drama or acting into an activity. Kids love to see you dress up and take on a persona, just by putting on a pirate hat when you read a pirate story or a funky set of glasses when you are searching for adjectives in a text could be the thing that hooks those reluctant learners. Certainly I am not saying you need to do this all day, every day but throwing it in every now and then can have amazing results. 6. Top Tip for getting along with parents. Hmmm, I have been told that I am not a person with tact and it is most likely true, although I do try :) I have to say that I have always welcomed parents into the classroom and even the little things like having a quick chat in the morning can make a difference. I have used many things over the years like communication books (can be time consuming) class newsletters, class blogs. In the end anything you do that opens lines of communication will be a good thing.....however if you do have a parent that is somewhat "tricky" make sure you document EVERY communication. Well as a person who luuurrrves shoes I will admit to wearing many shoes that are not likely to be seen as comfortable or necessarily safe. Having said that at 4 ft 11 if I do not wear a heel most of my students would be looking down at me, so for me heels it is! Other than that I try to wear clothes that will allow for comfort during the day with a professional look, oh I also try to wear clothes that do not need ironing, no time for that! Like most teachers I head to the Reject shop or Dollar shop or whatever you call it where you live. I also like to get bargains from the Scholastic Book Club as well as book packs that occasionally pop up at the Australia Post shops. Whatever you do make sure you keep the receipts for tax! In my house we get everything ready the night before, including lunches so in the morning it is not so hectic. Recently I have had to start relief teaching and that has made lunches a little more unpredictable, you never know when you will get a call with only half an hour to be at a school. In those instances I have a lunch box already packed with non perishable items, then I just throw in some fruit, you can see a blog post here about it. Otherwise I try to make a little extra dinner for lunch the next day. Drink...alot of alcohol....no I'm joking! There is no way you will get through a school year without having at least one or two meltdowns, accept that it will happen and try not to do it in front of children/parents/administration. Find something that will give you an emotional outlet, yoga, running, Pinterest, blogging, the occasional red wine and remember when you are getting to that point where you think it is all too much there are other teachers who you can turn to that not only understand but have been exactly where you are. Try to find a balance of work, family and time for yourself.....easy to say but it is important for your health and sanity to try. Well I am pleased to say that I have started 2014 with a good habit ( at least I am hoping it will become a habit)! January 1 I started running.....well I walked for a bit, then ran for a bit, then walked for a bit more and then a short run. I am now running more than I walk and that is only after 4 days. I have to tell you this is not easy for me, I am a self proclaimed exercise phobic, not strictly true, put a wine glass in my hand and some great tunes and I will dance up a storm! I have found out that not only is that embarrassing for your children but is also not the healthiest way to exercise....... bummer. 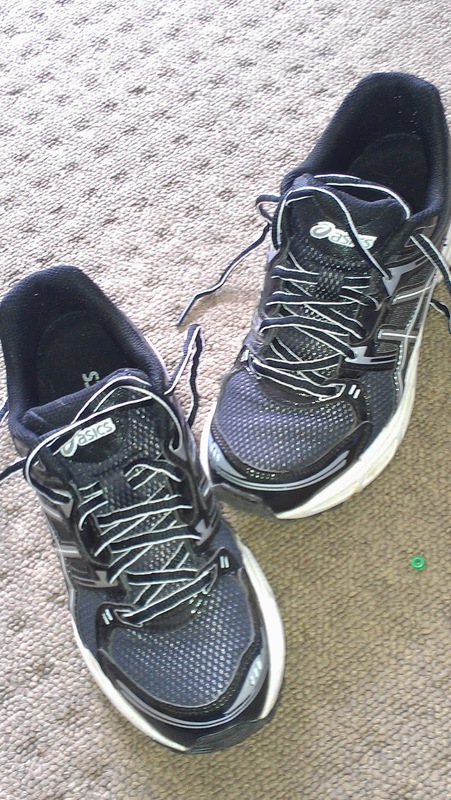 So my goal for this year is to get those shoes on at least 4 times a week and get my legs running/walking in said shoes. So far, so good, we will have to wait and see if I can continue this when school starts. That will be the true test as I often use not finding time as the best excuse for not exercising. I would love to hear of any tips or tricks you use to keep motivated through the year as I fear that I will fall off the wagon when life becomes busy. In the meantime I will just keep running! I have finally got back to blogging, oh how I have missed you!! What better way to jump back in than with a Currently from Farley :) Here we go! 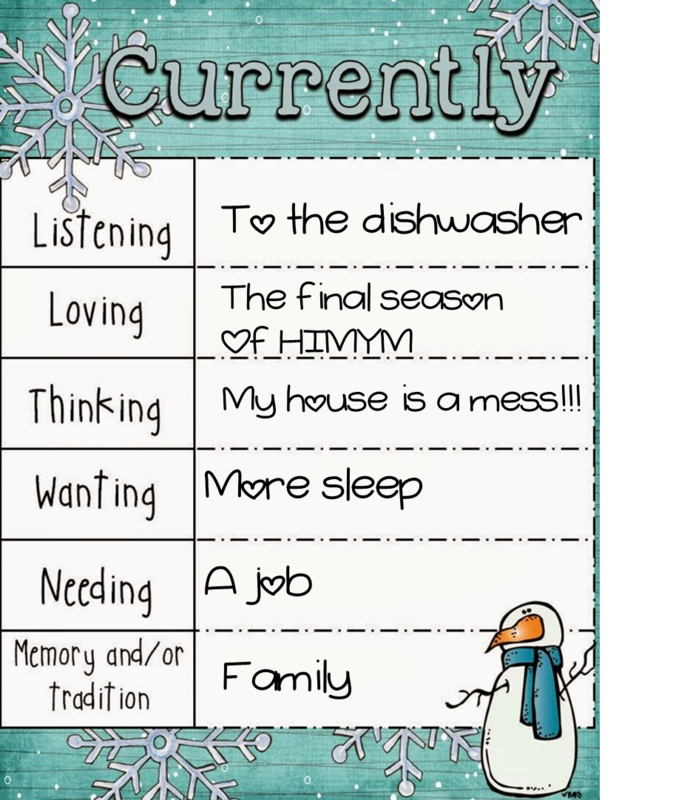 Listening- My poor dishwasher has been working overtime this Christmas as we have hosted Christmas lunch and had my sister in law and her 3 girls staying with us. People we are talking up to 3 loads a day! Loving- I have watched How I Met Your Mother right from the beginning, it became my new Friends ya know. Anywho I am really enjoying curling up on the couch for that half hour seeing all the threads coming together. Thinking- Well self explanatory really, did I mention that I have 4 teenage girls here plus a Lego loving 9 yr old boy, throw in visiting relatives who may or may not stay for dinner and really I think no more needs to be said! Wanting- We have had an absolute blast staying up till midnight chatting and drinking wine, I have been loving having so much family around but it is beginning to catch up. Needing- Well I go into 2014 without a full time job so I job hunting is on the list for the New Year friends. I come from a large family so having so many people around these holidays have made me really happy, I hope that we get to do this more often but with family living all over the country it can be tricky. Well your turn to link up!